Here are just the facts: 194 exhibiting galleries, some 3 500 contemporary artists and a lot of excitation until next Sunday,when, after for days, the fair will close its doors. FIAC is obviously not something for you and me. I mean you can have a look, what already will cost you 28 Euros for the entrance ticket. And than? Will you be able to buy something? Not at the Grand Palais, I suppose, the main spot where the world most important galleries show what they can sell for the highest price. Paintings start at 200 000 Euros and rise up until millions. You fall in love with the Calder mobile? It could be yours for 2,6 Million Dollars. But this is nothing compared to the 18 Million Euros you need to purchase the woman portrait of German painter Max Beckmann. Even Liliane Bettencourt, the L’Oréal-heiress, would need to think about it. 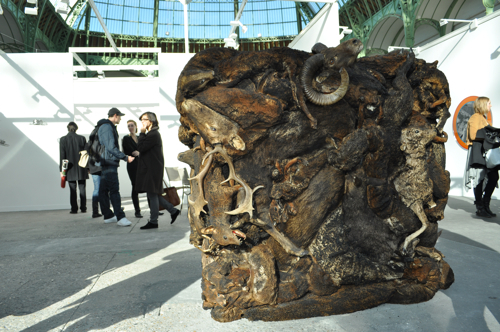 You don’t have 200 000 Euros to spent on a painting or a sculpture? Neither I do. Don’t worry. Let’s have a walk, let’s have fun. Here is a special Lady dressed in – in what? In flashy pincushions, I would say. She is not here to admire art; she wants to be an oeuvre all by herself. And she definitely is. Why should we take her less serious than the work of Andy Warhol at Gagosian Gallery? The American art titan Larry Gagosian not only opened a gallery in Paris theses days, he is also exposing at the FIAC for the very first time. People see this as a sign, a good one. And what does he show? Women only. Don’t get me wrong. It’s not exclusively female artists, it’s women on the painting: Warhol, Picasso, Richard Serra. Only men, to be exact. Cutting edge? Not exactly. 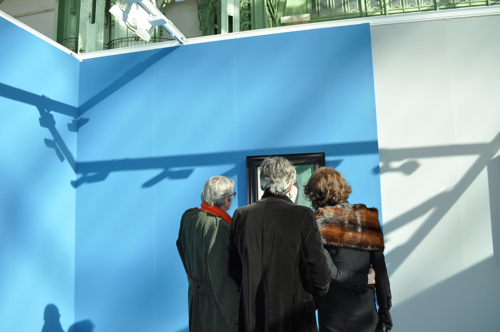 Some gallerists are obviously taking advantage on what is on program in the museums of Paris. There are photos of Larry Clark and I guess the debate about his exhibition in the Musée d’Art Moderne didn’t do any harm to their price. There is also the Jean-Michel Basquiat exhibition running and here you can admire two real Basquiats at the Van der Weghe gallery from New York. A few hours after the opening the first one is already sold. Another client is discussing about the other one left. He looks like if he was buying a new car. Nothing more. What is this? Compressed garbage? No, dead, stuffed animals. Deers and other sorts of pets. They look like burned. People are attracted to it and feel repelled at the same moment. Adel Abdessemed sculpture Taxidermy was also sold in few hours for 200 000 Euros. A crisis? What crisis? 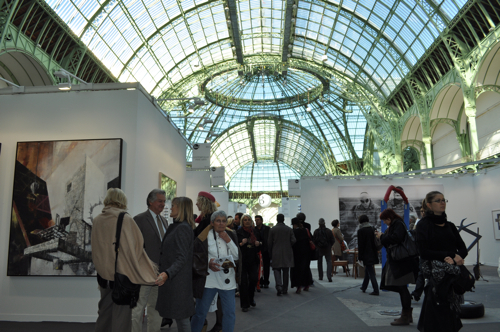 The clear October light is pouring through the glass roof of the Grand Palais. Imagine being a bee and flying upon all the hustle and bustle, just observing and listening to the buzz under you. Wouldn’t it look like a huge, human installation? The visitors are part of the art. And their work is not for sale. Should we take the Picasso home, darling? Brigitte Bardot will not like this: Taxidermy, 2010.